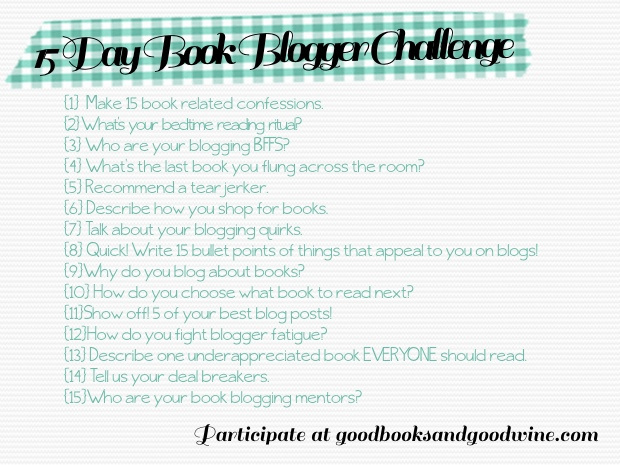 So I've been participating in this awesome event hosted by April @ Good Books and Good Wine where we talk about our bookish habits over 15 days with 15 prompts. I LOVE SHOPPPING FOR BOOKS! I have different ways of shopping for books: there's the one in which I randomly browse the bookstore and pick something up, the one where I go online once a month and buy books from my wishlist and then there's the book sales I go a little crazy at, as evidenced by this post. I live in the Netherlands and as much as I want to support my local bookstore, they just don't have all the books I want. They've only recently dedicated shelf-space to YA and while the selection is MUCH BETTER now, it's still pretty limited. I tend to read in English cause it takes ages for books to be translated and well, I save a little money this way as English books are much cheaper (try half the price). I do on occasion walk into our local bookstore and see if anything catches my fancy. Every couple of months there's an AMAZING book sale in different cities around Holland and since the books hardly cost anything there (I average about 2-3 euros per book, yay BARGAIN), I just load up my cart with anything that looks remotely interesting and then bribe the boyfriend to help me carry them home. So, what about you guys? What are your book shopping habits? Are you participating in this event as well? Leave me a link and I'll be sure to check out your post! What a lovely idea. I will put some thoughts together and get back to it. I'm a new follower. I'd never heard of The Book Depository before but the prices seem reasonable and yay for free shipping! I will try them the next time I'm going book shopping online. Our local library doesn't seem to have many of the books I want to read, which is why I buy so many of them. And yeah, I really want to support our local bookstore, but it's expensive! I love buying books, too. :) I'm happy I found the Book Depository because of the free shipping, regardless of how much you're buying AND I find that they're cheaper than Amazon. I hadn't heard of awesomebooks.com before, I'll check it out, it sounds really good! Seems to be a Dutch meeting here. May I join. I am not Dutch (I'm German) but live in the Netherlands, in the Deep South. Limburg. I, shamefully, buy 90% of my book on Amazon. Our local bookstore is Barnes and we don't have any independent ones. This spring I had to institute a book-buying embargo because my TBR pile was out of control. Unfortunately, I found a loophole in my own plan that said nothing against ARCs and barely made a dent even though I was still reading several books a month. Oh well! There are much worse problems to have! I am with Christine I buy most of my books from Amazon. My B&N isn't my favorite to deal with right now. Could you maybe do a post explaining your buying rules. I am interested to hear why you can only pre-order 100days out. I have a book buying problem and its nice to hear what others do to curb the habit at least for a little while. Most of my online books come from Amazon's marketplace sellers, where I buy used. While I often use the 'related books' section of amazon to find titles in my interest, most of my leads come from references in other books, or recommendations from thoughtful people whose work I admire, who I hear on the radio or whose columns I read online. Oh, and I give myself a certain amount every paycheck to spend on books. It varies on the week - sometimes it is $20, sometimes $35. Last year I bought eighty books, so I am trying very hard this year to use the interlibrary loan system more than I buy. So far, so good, but I'm beginning to lapse.. I'd love to participate in this event, I'll see if I can still hop on! Anyways, regarding book shopping: Car boot sales are amazing for bargain shopping 2nd hand books (30p for each book!) and I always check Amazon for sales/discounted books (I recently ordered Philippa Gregory's "The White Queen" for less than 4 pounds, which is pretty decent). I love just wandering around book shops and checking out the books too!